How you have been rejecting yourself rather than loving yourself? This will answer some of the things you are facing now. If you observe what happens during this full moon, Aries-Libra (myself-others), you can discover your issues with others, with yourself, issues in relationships, partnership, all the reflections of how your equilibrium between your masculine and feminine energies are working in your life now. Where do you need balance, appreciation, forgiveness, independence or affirmation? This ‘dance’ with others is the way to Love…God, everything that is, The One. When we criticize (and we are very used to doing this) we are no longer in a relationship with whatever it is we criticize, we have established a separation, a barrier between ourselves and the other. If we can observe and breathe, observe as if from behind a videocamera, and be present, we can have a direct relationship with others and with things. If we can observe alertly and without judging, without defining or concluding, we will find the other dimension. What is the essence behind all of this? It is to feel good and to be happy. If you are in the habit of feeling happy and feeling good, no matter what the situation may be, if you are in the habit of infusing this Lightbody energy into whatever the situation may be, then you will find that you manifest with greater and greater ease. Breathe deeply and feel how this possibility resonates within you. Most people are unhappy, and they are unhappy because there is no love in their hearts. Please, feel the Love that is already in your heart, breathe it and grow there, land there, and live-create from there. Your true self can create now from that center. Invoke your Inner Warrior in this Aries time, tell him about your dreams and desires, feel the power of your presence, be present, honor and respect yourself and every other being, feel you deserve what you want, establish the limits you need to develop. When he is activated you feel strong and protected. Ignore your brain, listen to your gut… meditate and receive this new connection to your gut instinct. Invoke the Violet Flame. It is one of the greatest gifts you can give to yourself, as well as to your loved ones and the world at large! 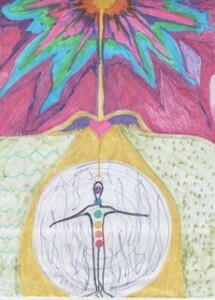 Visualize this flame inside, outside, in others, in your house, in your work, everywhere. Use this powerful resource to transform and dissolve karma, conflicts, old and negative feelings and patterns. Ascendant Masters and teachers used it here on earth, now it is available for all of us, yes! It can be as simple as it sounds, please try it! Previous post: Pisces job is done, happy equinox and welcome Aries energy!